The Alaska Native Studies Blog: "Whoever holds Alaska will hold the world:" The Bombing of Dutch Harbor June 3, 1942. "Whoever holds Alaska will hold the world:" The Bombing of Dutch Harbor June 3, 1942.
is the most important strategic place in the world." On the 3rd of June 1942 the Japanese military using two battle ships, The aircraft carriers Junyo (the peregrine falcon), and the Ryūjō (the "Prancing Dragon") on a bombing raid on the US base of Fort Mears located at Amaknak Island in Unalaska. At the time of the attack Fort Mears housed the 206th Coast Artillery, 37th Infantry Regiment, 6 anti-aircraft batteries, marines, and 30 fighters. The air fighters killed 25 soldiers that first day with 44 losses the next. The US military had been in residence there for two year in the build up of the Northern part of the pacific theater of battle in World War II, called the Aleutians Islands Campaign, also known as the “Williwaw War." 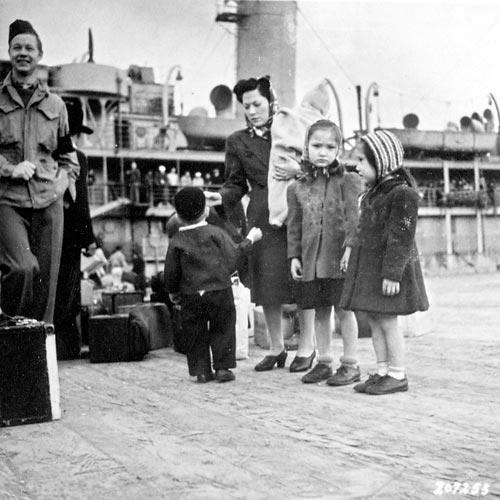 Unangax internees in Dutch Harbor in route to camps in the southeast.National Archives. The then territory of Alaska served as a strategic site for the military and the Unangax and Sugpiaq homelands became prime geographies for the war to ensue. In the middle of the war between the Allies and the Axis Unangax communities bore the burden of being subject hosts to the carnage. By the time of the bombing Unangax, forced to raze and evacuate their villages, maintained a presence there as subjects of interment by the government. The US would separate 881 Native individuals from their non-Indigenous families members and move them to places far out of their homelands for years. 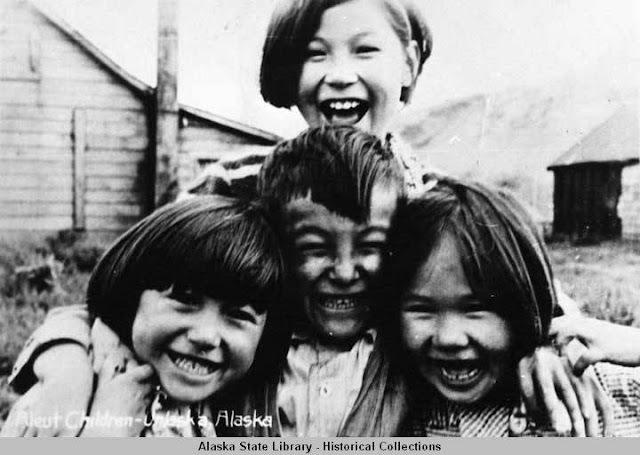 The public conversations surrounding this cultural experience often use the words Aleut "relocation," or "internment." On June 7th the Japanese military struck and occupied the islands of Attu and Kiska for a short time without incident. Months later, in 1943 during May 3-11 the Japanese forces would move forward with attacks on Attu in a battle to control sea lanes, referred to as the war's "Forgotten Battle." Japanese military also held over 40 Unangax civilians as prisoners of war in Japan. That both the Axis and the Allies held Unangax communities against their will allows for one to consider how Indigenous people are treated amid times when (strengthening) nation-states are at war. For the Unangax individuals as citizens of the nation deserved the freedoms the nation itself was explicitly fighting to uphold at the time. The Spanish nationalist government bombing of the Indigenous Basque community, by the Spanish partners the German and Italian air forces in 1937 presents a similar dreadful situation, Picasso depicted in Guernica. General Billy Mitchell's 1935 assertion to Congress "that in the future, whoever holds Alaska will hold the world..." because, "it is the most important strategic place in the world" was not wasted sentiment for either the Allies or the Axis, but such thought, and the actions that followed, required the denial of the right of the Unangax to decide how their homelands and surrounding waters should be used amid this global conflict. The rise of the cold war between the West and the Soviet Union in the decades that followed brought about conditions in the new state of Alaska that reflected Mitchell's conception of the region. Increased military presence and weapons testing brought about uses of land and water that would be decried if even given consideration elsewhere in the nation. Below is a clip of the October 2, 1969 Milrow nuclear detonation on Amchitka Island, one of the contested places in the war.